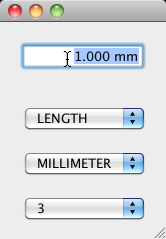 If you drive a motorized stage of a microscope you often have to handle coordinates in a unit like millimeter [mm]. But it might happen that the sample in your microscope is only in the range of microns [µm]. 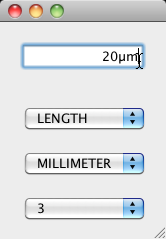 So would it not be nice to directly type in the coordinates in µm and the textfield would automaticaly convert the unit into [mm] ? For this reason i created a little component that extends a standard javax.swing.JTextField and is now able to do the conversion. 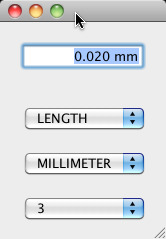 You could also use the conversion alone without the textfield to create some kind of unit converter…it’s up to you. So you could type in a value with the unit of your choice and after leaving the field or pressing enter the value will be converted into the textfields „base unit“. The upper combobox will select the type of unit you would like to use (it supports angle, area, length, mass, temperature, time at the moment but one could easily add more units to it). The middle combobox will select the current base unit for the textfield. The lower combobox will adjust the number of decimals for the textfield. Because it displays the unit directly in the textfield there’s no need for a additional label for the unit.